In a large bowl, combine together the dry ingredients. Set the bowl aside to whisk the egg white. Whisk the egg white until frothy in a medium-sized bowl. Returning to the dry ingredient bowl, stir in the maple syrup, butter or olive oil, honey, and vanilla until combined. Then gently stir in the whisked egg white until the mixture is evenly coated. Transfer the mixture to a porcelain or glass dish. The size of the porcelain dish I use is 9″x13″ (22.5cm x 33cm). Spread out the mixture, concentrating slightly more of the granola mixture near the edges, where it cooks more quickly. 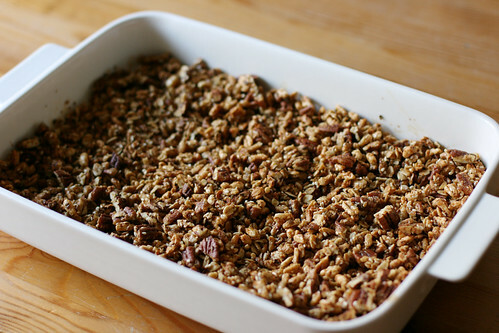 Bake the granola, stirring every 10 minutes, until the pecans are browned and the mixture starts to look and feel dry when stirred, about 45-50 minutes. The puffed grains will not be crunchy right out of the oven but they should become crunchy as the granola cools. Cool completely. 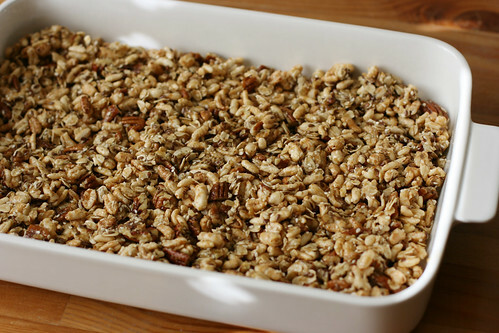 Once cooled, store the granola into an airtight container. I store mine in the 1 liter (33 3/4 oz) Bormioli Rocco Fido jar. 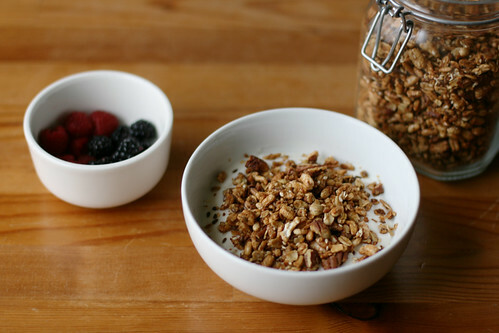 The granola keeps at room temperature for about two weeks. My favorite way to eat it is over plain yogurt sweetened with a little bit of maple syrup and honey and topped with fresh fruit. Check the nutritional label if you consume store-bought yogurt. Yogurt has a fairly large amount of sodium. Choosing original style rather than lower-fat yogurt helps. 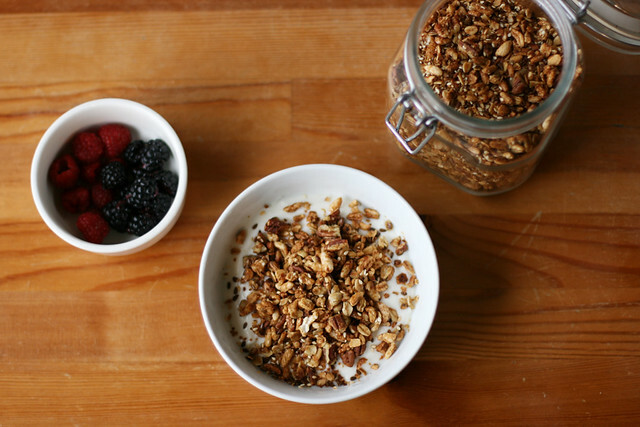 Add in all of your favorite granola toppings, skip all of the toppings you don’t like. 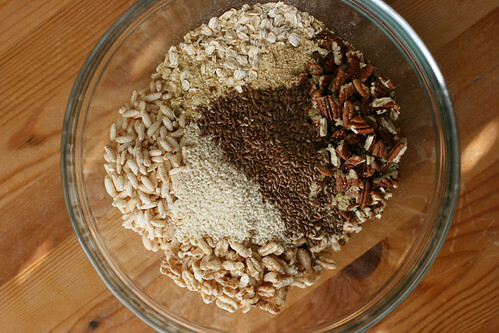 If you want to add dried fruit, add it before transferring the cooled granola to an airtight container. Choose the olive oil over the butter, skip the egg whites, and replace the honey with another sweetener. I’ve never tried to make a vegan version myself, but I suspect that it will still be very tasty though maybe not as crunch as the non-vegan version. They are the best granola i had so far! Thank you for sharing.